Reality is not a thing, but a process comprised of three interacting forces which are universal throughout the Great Process we call ‘the universe’. Consilient leaders understand this process, working with rather than against it. Not long ago I made a case for taking a little-known term out of seclusion and applying it in a fresh way to the realm of education. The term is consilience, and it speaks to what we hope will happen in every classroom (as well as outside them), where individual teachers and students are inspired to “leap together,” each beyond the self and together in community, caught up and transformed in the experience, returning to their individual centers of consciousness with deeper insight, better understanding, informed wonder, and a passion for more. Now I want to move consilience outside of education proper, to explore its relevance for leadership. The most effective leader, I propose, is a consilient leader who understands and works with the forces that everywhere interact in the process of reality affectionately known as our universe. Consilient leaders are more effective than nonconsilient ones, and individuals who cooperate with the universe tend to be healthier, happier, and more successful than those who strive against it, or who try to exploit its provident nature for selfish gain. I don’t mean to suggest that consilient leaders own more property or occupy higher social classes than these others. ‘Success’ here is not measured by status but by skill; consilient leaders are more skillful in what they do because they know how to move with the forces of reality rather than against them. In providing for the emergence of life and the ignition of consciousness, for a fertile culture of social support and our own self-actualization as human beings, the universe has set the stage for consilient leaders – indeed, the universe is a manifestation of consilience on the largest scale. One more qualification on this term ‘consilient leader’ before we jump into the diagram above. By leader I am not necessarily referring to an individual who leads others – a boss, manager, director, principal, president, general, prophet or pastor. I realize that I am crossing against a conventional assumption when it comes to what makes a leader, but I have a much bigger vision in mind. 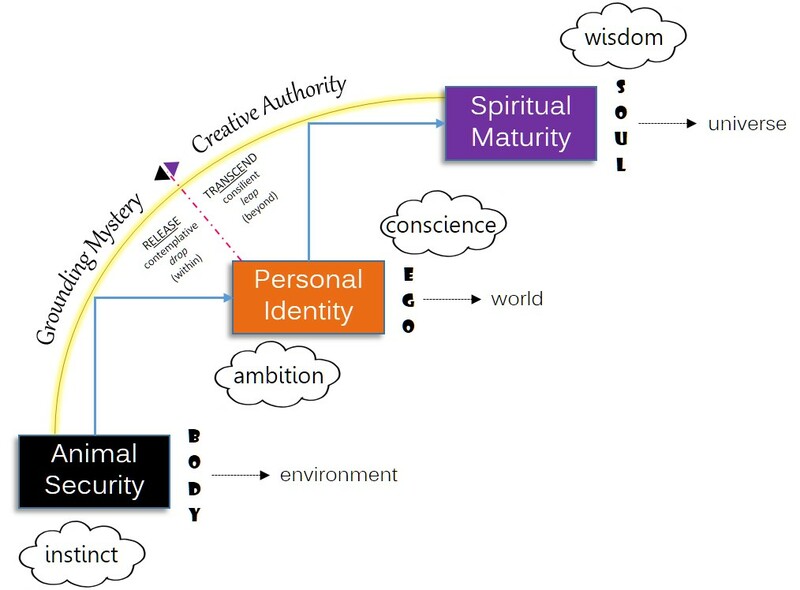 Seeing as how the universe has provided for the rise of creative authority (also known as self-actualization in human beings), a consilient leader is one who uses this creative authority to harness and channel its three forces for the ongoing evolution of genuine community. Others may or may not follow, but the consilient leader is still on the leading edge of human evolution. Let me give you a guided tour through my diagram, beginning with those three rounded rectangles arranged along the vertical axis. The first term in each rectangle names a level of organization in reality, while the second term identifies the force behind it. It will be easier to understand if we start with the middle set of terms: individual and integrity. By individual I mean any thing that more or less stands on its own – not in some absolute sense, since essentially All is One (as the name ‘universe’ implies), but relatively, in its own individual center while still in relationship with other things. The force that keeps the individual intact is integrity, literally holding together as a whole. 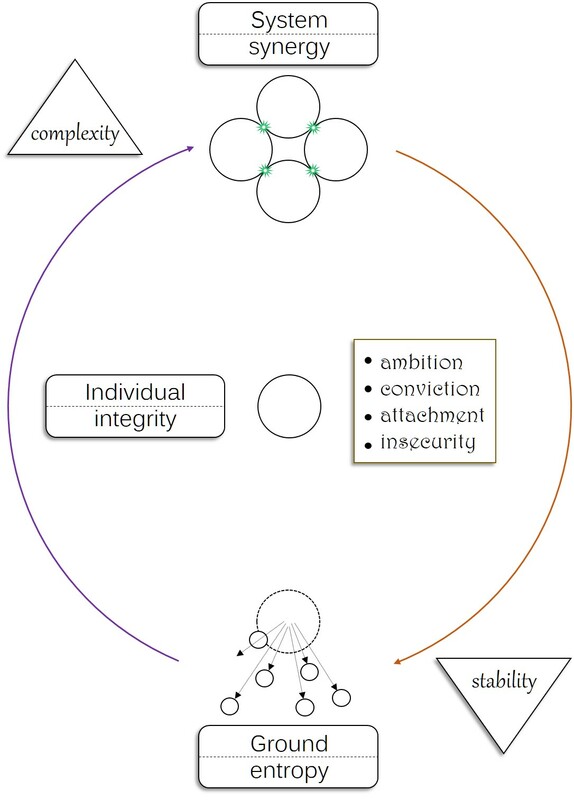 Individuals exist (taking a step upward in my diagram) in systems, which are higher-level organizations that illustrate consilience in an obvious way: a system is more than the mere sum of its parts (individuals). A second force, called synergy, connects individuals together and lifts them into a more energetic and complex web of influence. Synergy, then, is not merely additive (1+1) but exponential, with the higher circuit created in their connection capable of containing the energy jump (the force of integrity at this higher level), multiplying its value, and sharing power across the system. We might be tempted to imagine a universe where entropy is not in play. Isn’t it a depressing thought, all this breaking down, falling apart, and collapsing toward nothingness? Who needs it? Actually, we do. The whole universe would be impossible without the down-pulling force of entropy and its stabilizing ground. Of course from the individual’s perspective entropy is a major buzz harsher. But systems would burn themselves out in limitless synergy if it weren’t for the counterbalancing effect of entropy, bringing things down for rest and regeneration. And right in the middle of this cosmic tug-of-war, the force of integrity does its best to keep the individual intact. So, my definition of a consilient leader is one who understands that reality is a process manifesting from the interaction of three forces, which contain energy (integrity of the individual), connect individuals (synergy of the system), and collapse systems into more stable states (entropy and the ground). It should be clear from my diagram that reality is not a simple three-layer cake, but that these three forces interact throughout the universe, making nearly every speck an individual, caught up in systems and eventually dissolving into its ground. Look around and you’ll see evidence of their interaction everywhere. Learn how to work with these forces and you are on your way to becoming a consilient leader. There remains one part of my diagram to be explained: that box of four terms to the right of center. I’ve added these as a reminder that even consilient leaders are individual centers of personal identity, or egos, and their most important work is with other egos, as we all make our way, by fits and starts and frequent setbacks, into that most consilient and highly complex of systems known as genuine community. Egos complicate the work considerably, and the consilient leader must have a self-honest and perspicuous understanding of the challenge they represent. I’ll move down the list fairly quickly, encouraging my interested reader to explore other posts of mine where I analyze ego in greater depth. 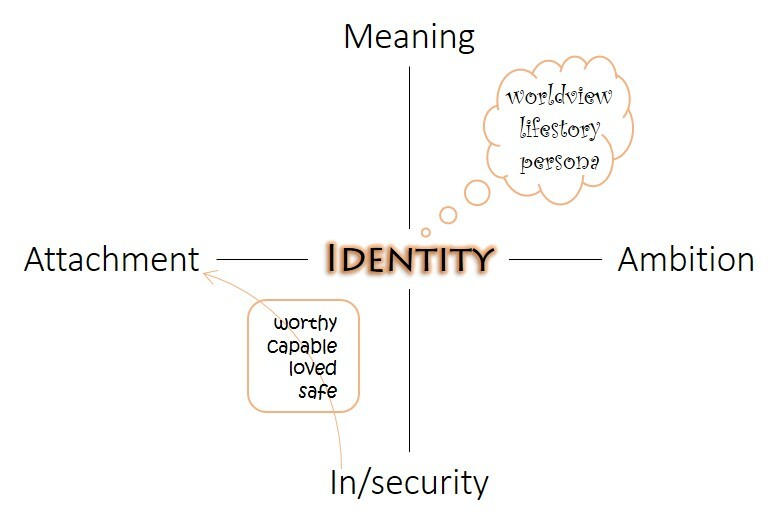 Every self-conscious center of personal identity (ego for short) holds certain ambitions for itself. 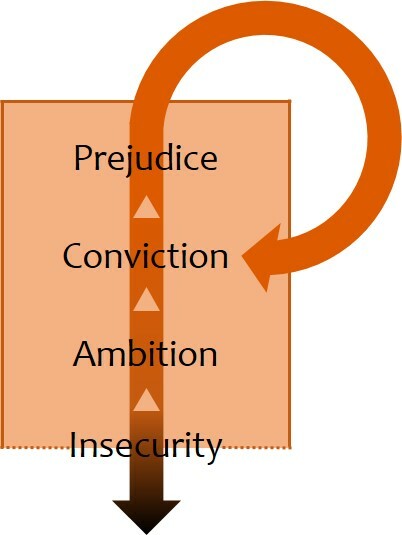 True to the word’s etymology, ambition involves the twin drives (ambi) of desire and fear, one (desire) straining for an imagined or promised reward, while the other (fear) harbors doubt and a growing anxiety around the prospect of failure or falling short of the goal. The insight that desire and fear lock the ego inside an interminable wheel of suffering is a central tenet of Buddhism. Nevertheless this is where ego is bound to stay – which is also why, for the Buddha, the only way out is through the realization that ego is without substance and simply dropping out of the wheel. These ambitions of ego are really the out-working effort of strong beliefs concerning the nature of things, the meaning of life, and the prospect of happiness. So strong are these beliefs, in fact, that they hold the mind captive and prevent the individual from “thinking outside the box.” Such beliefs – not held by the mind but holding the mind hostage in this way – are called convictions. As their prisoner (literally a convict), the mind is unable to entertain differing points of view, consider evidence against its own absolute truth, or even imagine any truth outside its precious orthodoxy. Through a combination of ruthless self-examination and social observation, a consilient leader understands that convictions are really just a defensive measure for the protection of certain attachments by which ego identifies itself. Attachments may be about nationality, ethnicity, religion, gender, age, sexual orientation, or whatever, but basically they are ways that individuals identify themselves with (or against) the world around them. The earlier they form, the deeper and more powerful they tend to be, pulling ego into the delusion that without them it is nothing. And again, but from a position of clarity rather than delusion, the Buddha would agree: the ego is really nothing. Inside even these attachments, then, is a persistent anxiety over the insecurity of ego’s condition. Because it is a construct of social experience and merely the managerial function (lacking substance) of personality, ego is inherently insecure – not only in feeling but in fact. This insecurity seeks compensation in attachments; attachments build justification behind convictions; and convictions drive the ambition for supremacy, perfection, retribution, salvation, glory, or whatever will finally make it better. I should emphasize the point that every ego has this neurotic architecture – even the ego of a consilient leader. The difference between the consilient leader and the rest is that he or she understands this and is vigilant to the occasions when ego conceit is posing as true integrity.